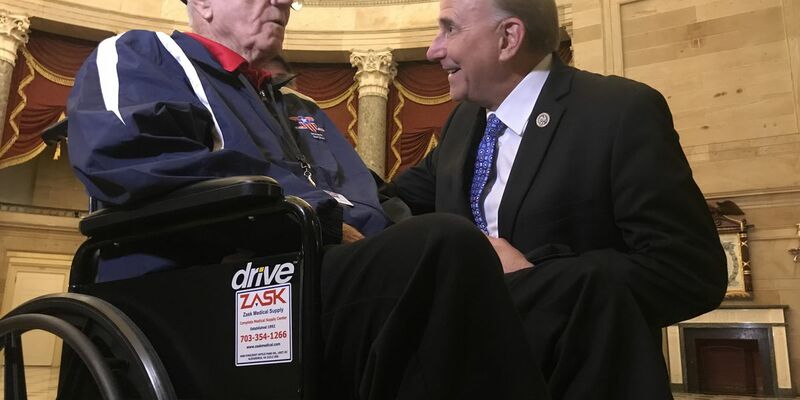 Congressman Gohmert spent time sharing history with the heroes. TYLER, TX (KLTV) - More than 20 World War II and Korean War veterans are in the nation’s Capitol this evening for the 17th Brookshire’s Heroes Flight. The trip comes at no cost to the veterans, but is invaluable to those involved. Five of the heroes on this trip from East Texas. And what stood out to them today was something that people kept saying to these men. Two words...thank you. A flight full of heroes headed for the nation’s Capitol...honored with a water cannon salute First in Tyler then in Louisiana..landing in the nation’s Capitol. They arrived to applause and hand shakes from people they’ve never met. “If you think about the service that they’ve done for our country, that’s first and foremost, but then also if you think about what they’ve done in terms of history, they’ve changed the history of the world. The trajectories of nations. And they’re apart of the reason why America is great today,” said Marlin Heron of the US Coast Guard. It was a day of firsts for many of our heroes; a tour of the US Capitol plus a history lesson from Congressman Louie Gohmert. Two of the students are the Abbott brothers from Temple and Tyler. “When we landed her in Washington and started down to get to the bus there were bookoos of people on each side wanting to congratulate us and I’ve seen the same hospitality ever since we got here,” said James Abbott. James Abbott and his brother H.O. Abbott are on this trip together, and thought they are hesitating to accept being called heroes, they say they are happy to be here. “Outpouring of people’s appreciation I’ve never experienced before,” Abbott said. On the schedule for Friday is a visit to Arlington National Cemetery and also the WWII and Korean War memorials. The heroes return to Tyler on Saturday night.